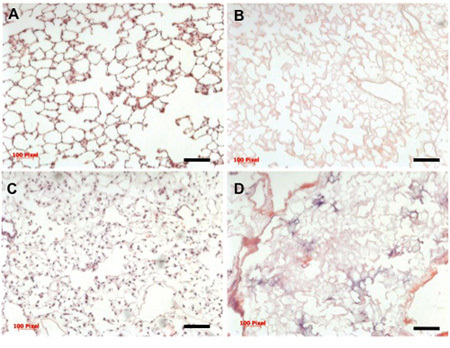 We have developed a decellularized lung extracellular matrix and novel biomimetic bioreactor that can be used to generate functional lung tissue. By seeding cells into the matrix and culturing in the bioreactor, we generate tissue that demonstrates effective gas exchange when transplanted in vivo for short periods of time. Calle, E. A., Petersen, T. H., Niklason, L. E. Procedure for Lung Engineering. J. Vis. Exp. (49), e2651, doi:10.3791/2651 (2011). Lung tissue, including lung cancer and chronic lung diseases such as chronic obstructive pulmonary disease, cumulatively account for some 280,000 deaths annually; chronic obstructive pulmonary disease is currently the fourth leading cause of death in the United States1. Contributing to this mortality is the fact that lungs do not generally repair or regenerate beyond the microscopic, cellular level. Therefore, lung tissue that is damaged by degeneration or infection, or lung tissue that is surgically resected is not functionally replaced in vivo. To explore whether lung tissue can be generated in vitro, we treated lungs from adult rats using a procedure that removes cellular components to produce an acellular lung extracellular matrix scaffold. This scaffold retains the hierarchical branching structures of airways and vasculature, as well as a largely intact basement membrane, which comprises collagen IV, laminin, and fibronectin. The scaffold is mounted in a bioreactor designed to mimic critical aspects of lung physiology, such as negative pressure ventilation and pulsatile vascular perfusion. By culturing pulmonary epithelium and vascular endothelium within the bioreactor-mounted scaffold, we are able to generate lung tissue that is phenotypically comparable to native lung tissue and that is able to participate in gas exchange for short time intervals (45-120 minutes). These results are encouraging, and suggest that repopulation of lung matrix is a viable strategy for lung regeneration. This possibility presents an opportunity not only to work toward increasing the supply of lung tissue for transplantation, but also to study respiratory cell and molecular biology in vitro for longer time periods and in a more accurate microenvironment than has previously been possible. The arterial cannula consists of a luer-lock fitting connected to a Y-splitter by a short segment of tubing. The luer-lock connector is attached to the perfusion tubing, and the segment of the Y that is not sutured to the pulmonary artery is connected to a one-way valve. The one-way valve is oriented such that fluid can be drawn up into the tubing (in the opposite direction as perfusion), but during organ perfusion all medium flows into the lung. The tracheal cannula also consists of a luer-lock connector linked to a Y-splitter with tubing. The luer-lock connects to a breathing loop between the trachea reservoir and the main chamber. The segment of the Y-connector that is not sutured to the trachea is also connected to a one-way valve. The one-way valve is oriented in the same fashion as the arterial cannula. The one-way valves in the arterial and tracheal cannulae are utilized to clear air bubbles in the tubing by enabling reversal of flow in the tubing and therefore permitting air bubbles to be removed. The "breathing loop" includes two one-way valves, positioned such that medium follows a different path into and out of the lung. A more detailed description of this feature is provided in a prior publication from our laboratory2. Vascular perfusion is provided using a roller pump. Medium is perfused into the pulmonary artery via the attached cannula, flows through the lung vasculature, and out the pulmonary vein directly into the main bioreactor, where medium is drawn up for perfusion. Euthanize adult (3-6 month old) Fischer 344 rats by sodium pentobarbital overdose, according to guidelines set forth by the American Veterinary Medical Association (60 mg/kg IP). Note: the pentobarbital solution includes heparin at 100 units/ml for anticoagulation. Spray or wipe the chest & abdomen with 70% ethanol. Open the thoracic cavity, exposing the heart and lungs, taking care to not damage the lungs. Carefully make a small window through the diaphragm into the thoracic cavity, causing the lungs to retract, and then expand this incision horizontally to expose the bases of the lungs. Make two incisions vertically through the ribs, and retract the chest cage to expose the heart and lungs. Prepare a gravity perfusion system, i.e. using a syringe with plunger removed, a 3-way stopcock, and ~20cm of tubing with a 1.5inch, 21-gauge needle. Maintain the syringe at ~20cm above the animal using a ring stand. Ensure that all air is removed from the perfusion tubing. Cut the right atrium to drain blood, preventing it from returning to the lungs. Cutting the left atrium to allow easy drainage of blood and perfusate from the lungs may also be helpful, but is not necessary. Insert the needle into the base of the right ventricle and open the stopcock to perfuse the lungs with a solution of heparin and sodium nitroprusside (50U/ml and 1ug/ml, respectively) in PBS. Confirm that the pulmonary artery fills with perfusion fluid, and that blood is clearing from lungs. If needed, refill the perfusion syringe with additional fluid. Typically only ~10ml is required. Continue perfusion until the lungs are clear of blood, then stop perfusion. Dissect the trachea free, up into the neck as far as possible. Ensure trachea is separated from the esophagus. Dissect all remaining connections to the heart, lungs and trachea, and remove en bloc. Using a scalpel or sharp scissors, cut off the apex of the heart, exposing the right and left ventricles. Cannulate the pulmonary trunk via the right ventricle, and suture in place. Remove any excess left ventricular tissue. Cannulate the trachea and suture in place. Make sure that both the tracheal and pulmonary arterial cannulae are positioned such that there is no torsional stress on the trachea, lungs, or great vessels (Figure 1). Ensure that there are no air bubbles in the arterial cannula, since air bubbles trapped in the system may prevent constant flow of through the organ. In some cases, an air bubble can completely halt fluid flow.To accomplish this, place the heart/lung bloc into a jar containing PBS. Use a syringe with needle to inject a small amount of PBS into the heart cannula to expel any bubbles. Lavage the airways with PBS 4-5 times, to remove as much air as possible from the lung. After lavage steps are complete, inflate the lung with PBS containing sodium nitroprusside (SNP) at 1ug/ml. Put a stopper on the tracheal cannula, so the solution remains in the lung. Allow the lung to incubate for up to 30 minutes, as the same solution flows through the vasculature via the pulmonary artery, to permit vasodilation. 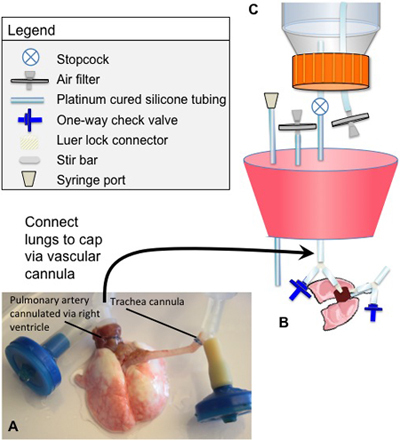 Connect heart/lungs to a bioreactor cap using the luer-lock connections linked to the Y-shaped cannulae, described in "Bioreactor Assembly" above. (Figure 1). 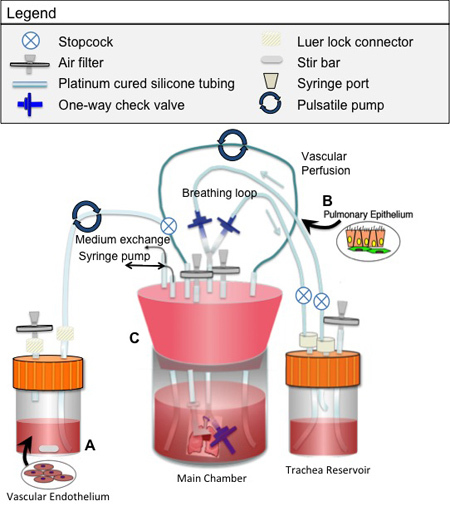 Connect the cap (with lungs attached) to decellularization apparatus (Figure 1). The pulmonary artery cannula should connect to the perfusion line, and the tracheal cannula should float free. Ensure all lines are clear of air. As described above, air in the lines can be a source of poor decellularization by preventing flow of decllularization fluid. Air trapped in the system can also persist into culture time, when it may have a negative impact on cell survival3. Inflate the lung with PBS/SNP until lungs are full, but not over-inflated. Immediately cap the tracheal cannula so that the lung remains inflated. Perfuse lung with PBS/SNP for at least 15 min at ~15 mmHg (20cm H2O pressure). After 15min or longer, remove the stopper from the tracheal cannula to allow the lung to deflate. Continue perfusion with PBS/SNP for 30min. If necessary, refill PBS/SNP to ensure perfusion pressure is maintained at 10-15 mmHg. Begin perfusion with decellularization solution (8mM CHAPS, 1M NaCl, 25mM EDTA in 1X PBS). Take care to ensure all lines are clear of air. A vacuum system may be helpful to provide suction. Perfuse with decellularization solution until 500ml of solution has perfused through the lung. Optimal pressure is <15 mmHg (~20 cm H2O). This typically will require 2.5 hours. Flow rates are typically very slow (0.2-0.5ml/minute) initially, and rapidly increase during the second hour to approximately 1ml/minute or greater. Periodically, remove used decellularization fluid from bioreactor, ensuring enough fluid remains to support the lung and tracheal cannula. Transfer lung and bioreactor to a tissue culture hood. Begin rinsing with sterile PBS by removing the 500ml jar that contained the decellularization fluid and replacing with a sterile jar containing up to 1L of sterile PBS. Use vacuum suction to ensure lines are clear of air. Perfuse PBS through the vasculature at 10-15 mmHg, in the same manner as for decellularization. Periodically, remove waste PBS from bioreactor and replace and/or refill the PBS jar with fresh, sterile PBS. It is advisable to use sterile technique. Continue rinsing until at least 2.5 L of sterile PBS have perfused the lung. Transfer lung to a new, sterile bioreactor system containing fresh PBS. Ensure that both the entire perfusion loop and the entire airway lines are filled with fluid. All subsequent steps will use a pulsatile pump to perfuse the lungs at 5ml/min. Sterilize the scaffold, either via overnight perfusion with PBS + 10% FBS + 10% pen-strep solution or for 3 hours with 0.1% peracetic acid in PBS. The latter will require rinsing the lung with 3 changes of 250ml PBS over several hours to remove residual acid. For each rinse, the lung should be ventilated as well as perfused to ensure that all parts of the tissue are rinsed thoroughly. Transfer the lung to a 37°C incubator and perfuse with PBS that has 10% FBS and 10% penicillin/streptomycin for ~1hr or until temperature is equilibrated, in preparation for benzonase treatment. Warm the benzonase buffer (see Table of Reagents) to 37°C. For each lung, fill one 10ml syringe with benzonase buffer only and one 10ml syringe with 90U/ml benzonase in buffer. Stop perfusion of the lung. Inflate the airway with benzonase buffer. Allow the lung to deflate (for ~1 minute). Then, inflate the lung with the benzonase solution. During the inflation with benzonase buffer & benzonase, try to avoid injecting any air into the lung. Allow the lung to sit without perfusion or ventilation at 37°C for 1 hour after inflating with benzonase. Resume perfusion with the PBS + 10% FBS, 10% penicillin/streptomycin that is already in the bioreactor, and continue overnight. The following day, the lung can either be stored at 4°C (for up to 3 months) or prepared for cell seeding. To prepare the scaffold for cellular repopulation, replace the PBS/FBS/benzonase solution with ~250ml of culture medium. Perfuse for at least one hour before cells are introduced, and replace with fresh culture medium directly before seeding cells. The choice of cell source for organ reseeding is left up to individual investigators. Many cell sources can be utilized, including commercially available populations, freshly isolated neonatal or fetal pulmonary cells, embryonic stem cells, or commercially available cell sources. Specific isolation protocols for these cell populations can be found elsewhere4,5,6. Here, we provide instructions on how to seed both endothelial and epithelial cell populations. Prepare a suspension of desired endothelial cell population, in appropriate culture medium. Filter cell suspension through a 40um cell strainer to remove cell clumps. A typical endothelial seeding in our laboratory would utilize approximately 30 million rat lung microvascular endothelial cells in 60ml of culture medium. Dispense cell suspension into a small reservoir temporarily incorporated into the perfusion loop of the bioreactor (Figure 2). Ensure that the tubing from this reservoir and the entire perfusion loop is clear of air bubbles. Infuse cells into the pulmonary artery at 3ml/min using a roller pump. After cell infusion, continue perfusion with medium recirculated from the main bioreactor at desired rate. On a daily basis, ensure that the perfusion tubing is clear of air bubbles. Medium should be replaced with fresh medium regularly; this is often done every 3-4 days. Prepare a cell suspension of the desired epithelial cell population. In our laboratory, this typically consists of approximately 50-100 million neonatal rat pulmonary cells. Filter the population through 40um cell strainer and suspend in 15ml of culture medium in a syringe. Fill the airway reservoir with 80ml of culture medium. Place the bioreactor in a 37°C tissue culture incubator, and connect the syringe pump for ventilation. Ensure all ventilation lines are clear of air. Seed the cells into the lung by injecting 15ml of cell suspension as a single bolus into the tracheal cannula. Immediately begin a single, slow breath using the syringe pump. This breath is administered by withdrawing 60ml of air from the main bioreactor at 3ml/minute, thus lasting approximately 20 minutes. Ensure the air filters on the main bioreactor are capped off immediately after injecting the cell suspension and before beginning the slow breath. Allow the lungs to sit statically for approximately 18hrs, and then begin slow vascular perfusion (approximately 0.5 ml/min). During endothelial culture, perfusion is typically performed at 1-3 ml/min using a roller pump. During epithelial culture, ventilation is typically provided at a continuous rate of 1 breath per minute using a syringe pump. Withdrawal of 5-10ml of air from the main bioreactor is typically required to effect lung ventilation at a normal tidal volume. Due to the need to maintain the bioreactor airtight during ventilation, ventilation should be paused daily and the air in the main chamber should be exchanged. All air in the system is room air, which is approximately 21% oxygen by partial pressure. The 5-10ml withdrawal of air from the bioreactor (which induces a 5-10ml inspiration of fluid by the lung) is based on the size of the lung and how many lobes are being cultured (lobes can be tied off for analysis, while the remaining lobes continue in culture). The amount of air withdrawn by the syringe pump is chosen to approximate the "tidal volume" of the cultured lung. Medium should be changed approximately every 3-4 days during culture. During co-culture of both epithelium and endothelium, experiments in our laboratory typically first seed the epithelium for 4-8 days, during which time the engineered tissue is ventilated. The endothelium is then seeded via perfusion, after which the tissue is both perfused and ventilated. When the protocol is performed correctly, the freshly extracted lungs should hold air without leaking. Inflating them with air while submerged in liquid can check this - there should not be any bubbles indicating air leaks. The subsequent decellularization should allow ~500ml of decellularization fluid to flow through the lungs over the course of 2.5 - 3 hours at 37°C, and PBS should ultimately be able to flow through the lungs at about 10 ml/min (under ~15 mm Hg of hydrostatic pressure) at the end of rinsing. After treatment with 0.1% peracetic acid and benzonase, lungs can be stored at 4°C for up to 3 months, and still remain suitable for recellularization. The final decellularized extracellular matrix should be completely devoid of cellular materials, and retain the gross, microscopic and ultrastructural characteristics of native lung. Insufficient decellularization or rinsing may result in remnant DNA "sticking" to the scaffold, which can be visualized with a standard hematoxylin and eosin stain (see Figure 3 for comparison). If cells are freshly isolated from 7 day old neonatal rat pups, as described in the online supplement accompanying the work by Petersen and colleagues4, one can expect a cell yield of 120-150 millions cells per litter of 10 pups (just over 10 million cells per neonate). Optimal conditions for cell seeding and subsequent culture of the lung in the bioreactor should yield well-distributed cells within all 5 lobes of the lung, and should provide coverage of approximately 70% of the extracellular matrix scaffold (Figure 3). 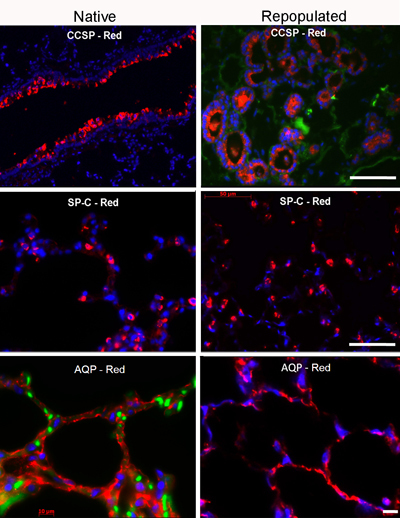 The cultured cell population will be positive for key respiratory cell markers such as pro-secretory protein-C (SPC), Clara cell secretory protein (CCSP), and aquaporin-5 (AQP), in order of relative abundance (Figure 4). The most critical aspects of the system presented here include maintenance of sterility, and close monitoring of pressures applied to the vascular bed throughout the process of preparing and seeding the scaffold and culturing the repopulated lung. Sterility is best maintained by autoclaving all materials prior to use, and by mounting the lung in a closed system shortly after explant and avoiding subsequent breach of this barrier. After the decellularized matrix has been thoroughly rinsed and transferred to a sterile bioreactor for culture, the silicone cap and other seals and connections should not be disturbed or removed. To keep pressures in check, flow driven by gravity is preferable whenever possible. When a pump is required for recirculation of fluid, beginning after rinsing with PBS and continuing during culture, we recommend directly measuring the pressure just before the fluid enters the pulmonary artery with a pressure transducer. The magnitude of the applied pressure should not exceed 15 mm Hg. Recellularized lungs can be cultured for varying time periods, typically ranging from 4 days to up to 3 weeks. Vascular perfusion is typically accomplished at 1-3 ml/min during endothelial culture, while ventilation is typically applied at a rate of 1 breath/min during epithelial culture. During combined culture periods, simultaneous ventilation and perfusion is appropriate. Ventilation can be performed with either liquid medium or air. Over the course of the last several decades, several groups have done important tissue engineering work showing the feasibility of differentiating lung epithelium in vitro and of replicating several aspects of lung microanatomy7,8,9,10. However, until recently,4,5 none of these attempts to engineer lung tissue had resulted in an implantable organ that was able to maintain separation between the blood and airway compartments and that could participate in gas exchange. Therefore, though the methods described are only an initial step toward the long-term goal of generating functional lung tissue, this work is an encouraging step toward the possibility of increasing the amount of lung tissue available for transplant. Moreover, this work elaborates work done by Ott et al. and Uygun and colleagues11,12, demonstrating the efficacy of a decellularized extracellular matrix as a scaffold for tissue engineering complex three-dimensional structures and supporting the growth and survival of various types of cells. This work is also significant for its contribution to the armamentarium of respiratory cell and molecular biologists. By providing a unique, three-dimensional environment that can also provide appropriate mechanical stimuli, and that does not share the attendant hazard of rapid de-differentiation that one might encounter when culturing rodent epithelium in the laboratory with more traditional methods13,scientists could use our system to gain new insight into cell-cell and cell-matrix interactions that play a role in cell differentiation and function. This knowledge may be particularly powerful if used as leverage to guide the fate of various stem cell populations, as Cortiella's group has demonstrated in initial studies14. L.E.N. holds stock in Humacyte, a regenerative medicine company. Humacyte did not fund these studies, and did not affect the design, interpretation, or reporting of any of the experiments or methods described. The authors (L.E.N., T.H.P., E.A.C.) and Yale University have filed a patent application related to tissue engineering of lungs. We thank Maegan B. Colehour for help with bioreactor development. These studies were funded by Yale University Department of Anesthesia and by NIH grant HL 098220 (to L.E.N.). T.H.P. was supported by NIH T32 GM007171. American Lung Association. Lung Disease Data. (2008). Petersen, T. H., Calle, E. A., Colehour, M. B., Niklason, L. E. Bioreactor for the Long Term Culture of Lung Tissue. Cell Transplant. (2010). Bilek, A. M., Dee, K. C., Gaver, D. P. Mechanisms of surface tension induced epithelial cell damage in a model of pulmonary airway reopening. J Appl Physiol. 94, 770-783 (2003). Petersen, T. H. Tissue-Engineerined Lungs for in Vivo Implantation. Science. 329, 538-5341 (2010). Ott, H. C. Regeneration and orthotopic transplantation of a bioartificial lung. Nat Med. 16, 927-9233 (2010). Cortiella, J. Influence of acellular natural lung matrix on murine embryonic stem cell differentiation and tissue formation. Tissue Eng. Part A. 16, 2565-2580 (2010). Sugihara, H., Toda, S., Miyabara, S., Fujiuyama, C., Yonemitsu, N. Reconstruction of alveolus-like structure from alveolar type II epithelial cells in three-dimensional collagen gel matrix culture. Am J Pathol. 142, 783-7892 (1993). Choe, M. M., Sporn, P. H., Swartz, M. A. Extracellular matrix remodeling by dynamic strain in a three-dimensional tissue-engineered human airway wall model. American Journal Respiratory Cell Molecular Biology. 35, 306-306 (2006). Cortiella, J. Tissue-enginered lung: an in vivo and in vitro comparison of polyglycolic acid and pluronic F-127 hydrogel/somatic lung progenitor cell constructs to support tissue growth. Tissue Engineering. 12, 1213-1213 (2006). Price, A. P. Development of a Decellularized Lung Bioreactor System for Bioengineering the Lung: The Matrix Reloaded. Tissue Eng Part A. (2010). Ott, H. C. Perfusion-decellularized matrix: using nature's platform to engineer a bioartificial heart. Nat. Med. 14, 213-221 (2008). Uygun, B. E. Organ reengineering through development of a transplantable recellularized liver graft using decellularized liver matrix. Nat. Med. 16, 814-820 (2010). Shannon, J. M., Mason, R. J., Jennings, S. D. Functional differentiation of alveolar type II epithelial cells in vitro: effects of cell shape, cell-matrix interactions and cell-cell interactions. Biochim. Biophys. Acta. 931, 143-156 (1987). Cortiella, J. Influence of Acellular Natural Lung Matrix on Murine Embryonic Stem Cell Differentiation and Tissue Formation. Tissue Eng Part A. (2010).